Theatre history and literature, dramaturgy, playwriting, directing, gender and theatre. 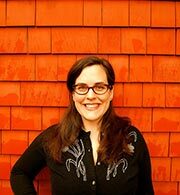 Kate Bredeson is a theatre historian, a director, and a dramaturg. Her book Occupying the Stage: the Theater of May '68 is published by Northwestern University Press (2018). Her second book, A Lifetime of Resistance: the Diaries of Judith Malina 1947-2015 will be published by Routledge. Kate has earned fellowships and awards including a Beinecke Visiting Research Fellowship at Yale; a Fulbright in Paris; residencies at the Rockefeller Foundation in Bellagio, Italy, the Camargo Foundation in Cassis, France, and Caldera in Sisters, Oregon; fellowships from the New York Public Library, Killam Foundation, Mellon Foundation, American Philosophical Society, the Institut Français de Washington, the American Society for Theatre Research, and she is an alum of the Mellon Summer School of Theatre and Performance Research at Harvard University. She is the recipient of a 2017 NEH summer stipend. Kate regularly presents at national and international conferences, and has published articles in PAJ, TDR, Theater, Theatre Symposium, Modern and Contemporary France, The Tennessee Williams Literary Journal, and Time Out Paris. She has essays in the books The Sixties, Center Stage: Mainstream and Popular Performances in a Turbulent Decade (Michigan, 2017), The Routledge Companion to Dramaturgy (Routledge, 2014), International Women Stage Directors (U. Illinois, 2013), and May 68: Rethinking France's Last Revolution (Palgrave, 2011). As a dramaturg, she has collaborated with the Court Theater in Chicago (Resident Dramaturg 2008-09), Guthrie Theater, Yale Repertory Theatre, Yale Cabaret, Portland Playhouse, documentary filmmaker Eric Nordstrom, and choreographer Tahni Holt. Kate is a winner of the Literary Managers and Dramaturgs of the Americas (LMDA) 2017 Bly Fellowship, and the 2011 LMDA residency grant. She is a board member for Portland's Risk/Reward festival, and a frequent collaborator with the Portland Institute for Contemporary Art. Kate has taught at the University of Chicago, Dalhousie University, Yale University, and has been Visiting Associate Professor of Playwriting in the Hollins University MFA Playwriting program. Kate holds an MFA and a doctorate in Dramaturgy and Dramatic Criticism from the Yale School of Drama. Reed Magazine feature article: "Taking Off the Gloves: Prof. Kate Bredeson challenges students to make theatre that is both real and unreal."